Back in 2009, Alibaba Cloud, a subsidiary of e-commerce hub-Alibaba Group decided to consider its cloud computing capabilities into the public service and entered the world of cloud computing with billion-dollar strategic planning. Alibaba now cloud offers a comprehensive suite of global cloud computing services that empower the online business of international customers, as well as Alibaba Group’s own e-commerce ecosystem. After the successful establishment of its products and services in the Chinese and Asian marketplaces, Alibaba Clouds now wants to try out the business in the Indian market too. The offerings from Alibaba Cloud includes high-performance, elastic computing power in the cloud with services on the basis of the pay-as-you-go model. The wide range of services that Alibaba Cloud offers are relational databases, Anti-DDoS protection, big-data processing, data storage, and Content Delivery Networks (CDN). Simultaneously, Alibaba Cloud promises to deliver research and development of large database systems and advanced big data technologies. The R&D efforts are committed towards the advancements of the Internet of Things (IoT) technology, automotive networking and information systems, smart homes, virtual reality, and cloud-based mobile device operating systems. Let us explore some of the major advantages of Alibaba Cloud services that not only make it China’s largest public cloud service provider but also the third largest worldwide. Hybrid Capabilities: Alibaba offers highly scalable cloud services supported by the capabilities of hybrid cloud infrastructure and flexible computing power, advanced real-time data processing and analytics. Alibaba cloud has developed Apsara- the super computational engine, capable to ensure the efficiencies of networks and systems. Reliable and Trusted: Alibaba Cloud stands out to be the first cloud security provider to earn the ISO Information Security Management System Certification in China which makes it popular among users. Moreover, Alibaba cloud is one of the first few service providers to offer Cloud Security alliances (CSA) Star certification for its global facilities. This certification is an enhancement to ISO/IEC 270001 standard that addresses issues regarding cloud security. Record-breaking Performance: Alibaba Cloud has set new records at Sort Benchmark in data sorting, and has a proven record in mitigating DDoS attacks along with processing high volumes of e-commerce transactions. Stable and Fast: With 1500+ advanced distributed global system architecture, Alibaba is all prepared to avail storage resources and adequate bandwidth to its end-users where a single node is capable to provide a bandwidth of 40 GB and more and the storage capacity varies between 40 TB to 1.5 PB. The stability offered by Alibaba cloud guarantees a 95% hit rate and video fluency rate including millisecond-level response time. Alibaba cloud offers 24×7 network-wide monitoring, smart monitoring and scheduling based on the quality of the service required. 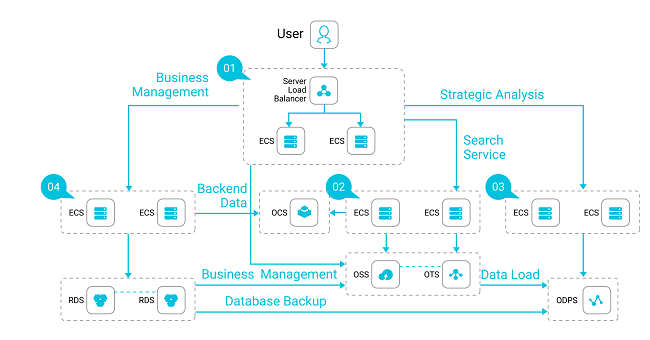 Cost-Effective: The scalable resources offered by Alibaba Cloud are cost-effective and are charged on the basis of the pay-as-you-go model. This simply helps users to attain cross-carrier and cross-region network-wide coverage. To meet the business demands, there are two different billing methods introduced by the Alibaba Cloud: PayByTraffic and PayByBandwidth. The service automatically responds according to the website traffic and makes adjustments without any user intervention, which reduces the pressure on the vendor’s end. Easy to Use: Alibaba Cloud gives their users the privilege to delete, modify, add and query domain names on their own by using a wide range of simple custom configuration options. Content Delivery Networks (CDN) supports cache policies, HTTP request headers, and other functions. The open API interface approach offers functions like content refreshing, service activation, distribution log downloads monitoring data retrieval and that make the cloud services much easier to use. Originally designed and launched to regulate website traffic and manage data of Alibaba Group’s e-commerce platform, Alibaba has now taken over the cloud computing market with a storm and is rising as another top global cloud service provider with robust services and business strategies. i2k2 Networks feel privileged to join hands with Alibaba Cloud Services and become its premier partner. We are excited to explore the transformative computing services of Alibaba Cloud that might proffer bigger and better public cloud solutions and business opportunities for our esteemed clients. Contact our sales team at +91-120-466 3031 |+91-971-177-4040 to know more. You can mail your queries at sales@i2k2.com.